Iba-no-saka-kudashi Matsuri. More HigashiOmi photos here. Neighbors Omi-Hachiman, Hino-cho, Ryuo-cho, Aisho-cho, Taga-cho, Koka, Mie Pref. Higashi-Omi (東近江市; also spelled Higashiomi) is a city in Shiga Prefecture east of Lake Biwa. Centering on the former city of Yokaichi 八日市, where Yokaichi Station and the city hall are located, Higashi-Omi is spread over a wide area from Notogawa on the shore of Lake Biwa to the mountains in Eigenji bordering with Mie Prefecture. It is most famous for its giant kite festival held on the last Sunday of May (cancelled in 2016). In fall, Eigenji temple is a popular place for autumn foilage. The city is largely rural, with the population and businesses concentrated in Yokaichi and Notogawa. There are also a few large factories, especially electronics. Higashi-Omi was newly formed in 2005 through municipal mergers with neighboring towns Eigenji-cho, Gokasho-cho, Aito-cho, Koto-cho, and later Notogawa-cho and Gamo-cho in 2006. The later joining of Notogawa-cho finally gave the formerly landlocked city a lake shore as well as a train station (Notogawa) on the busy JR Tokaido/Biwako Line. The city's land area is now the third largest in Shiga. It has numerous train stations along the Ohmi Railway Line. The city's name is pronounced "Higashi-Omi," not "Higashio-mi" nor "Higa-shiomi." The break is between "Higashi" and "Omi." 2nd Mon. in Jan. - Coming of Age Ceremony with Giant Kite. 1st Sun. in Dec. - Tarobogu Shrine Bonfire Festival - The bonfire is used to burn about 100,000 goma prayer tablets collected from all over Japan. The fire's spiritual force supposed to ward off accidents and sickness. Toward the end, there is fire-walking on the hot embers. To go to Yokaichi Station from the Tokaido Main Line, transfer trains at Omi-Hachiman Station and board the Ohmi Railways. From Maibara or Hikone Station, it is possible to take the Ohmi Railways, but it might be faster to take the Tokaido Main Line to Omi-Hachiman and transfer to Ohmi Railways there. Near Yokaichi Station, inside the Honmachi shopping arcade, the Machikado Joho-kan (Information Hall) is a tourist info office and souvenir shop. If you see the Higashiomi Giant Kite Festival, you can apply on-site to pull the giant kite. You will have to run for 50 meters or so, so don't carry a rucksack or camera when pulling the kite. Starting your Gokasho tour from Notogawa Station by bus (get off at Iki-iki-kan-mae bus stop) might be better than starting from Gokasho Station. 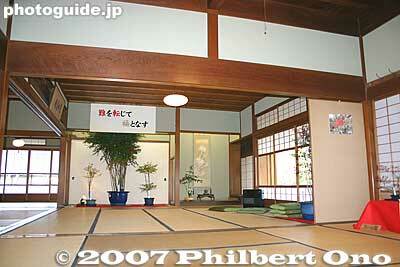 The Iki-iki-kan center has a tourist info office, whereas Gokasho has no tourist info office. To see Eigenji in Nov., take a bus from Yokaichi Station. Buy a discount bus pass which you can use visit Eigenji and the Koto Sanzan Temple Trio. Higashi-Omi has two main train stations: Yokaichi Station on the Ohmi Railways Main Line, and Notogawa Station on the Tokaido/Biwako Line. Yokaichi Station is at the city center, near City Hall, while Notogawa Station is on the fringe toward Lake Biwa, near the giant waterwheel park. Both of these stations have local buses which run within the city. There is also Gokasho Station which is near the Omi-shonin merchant homes. Yokaichi Station is accessible from Maibara Station (if you are coming from Tokyo), Omi-Hachiman Station (if you are coming from Kyoto/Osaka), and Kibukawa Station (if you are coming from the Kusatsu Line). Notogawa Station is accessible from Maibara Station and any station on the Tokaido Main Line (Osaka/Kyoto). From Tokyo Station to Yokaichi Station: JR Tokaido Shinkansen to Maibara Station (2.5 hours), then transfer to Ohmi Railways for Yokaichi Station (45 min.). From Tokyo Station to Notogawa Station: JR Tokaido Shinkansen to Maibara Station (2.5 hours), then transfer to Tokaido Main Line for Notogawa Station (18 min.). From Kyoto Station to Yokaichi Station: JR Tokaido/Biwako Line bound for Maibara or Nagahama and get off at Omi-Hachiman Station (33 min. ), then transfer to Ohmi Railways　(18 min.). The city has numerous train stations, especially on the Ohmi Railways. The main train stations are Notogawa Station on the Tokaido Main Line and Yokaichi Station on the Ohmi Railways. Local buses also stop at these two stations. Notogawa Station (能登川駅) - Giant water wheel is the town's symbol, and the station's facade is also partially shaped like a water wheel. A small shopping center is next to the station. Gokasho Station (五箇荘駅) - Famous for Omi merchant homes. Kawabe-no-Mori Station (河辺の森駅) - Near Kawabe Ikimono no Mori nature park. Yokaichi Station (八日市駅) - Main station for HigashiOmi city and transfer point for the Ohmi Railways' Main Line and Yokaichi Line (for Omi-Hachiman). Kyocera-mae Station (京セラ前駅) - Near Kyocera factories. Runs betweenOmi-Hachiman Station on the Tokaido Line and Yokaichi Station in Higashi Omi. Tarobogu-mae Station (太郎坊宮前) - Unmanned train station. Mainly residential and farmland. Tarobogu Shrine is nearby on a scenic, rocky mountain. Shin-Yokaichi Station (新八日市) - Nice Taisho-Period station building. Yokaichi Station (八日市) - Main station at the center of Higashi Omi city (formerly Yokaichi city). Since Yokaichi Station is the city's main station, local bus service starts here. The bus route goes as far as Eigenji. Taxis also are available at Yokaichi Station. Buses from Notogawa Station also go to Gokasho and Yokaichi. Click on upper right icon to view a larger map. 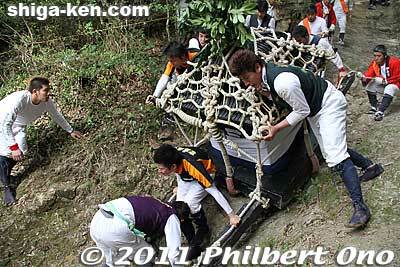 More photos at Higashi-Omi Photos. 1932 - Notogawa-cho town established through the merging of several villages. 1954 - City of Yokaichi established through the merging of Yokaichi town with several neighboring villages. Koto-cho town established through the merging of neighboring villages. 1955 - Towns of Eigenji-cho, Gokasho-cho, and Gamo-cho and Aito Village established through the merging of several villages. 1971 - Aito Village becomes Aito-cho town. 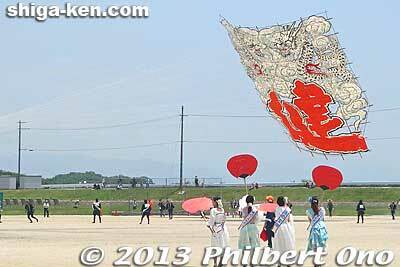 1982 - The Yokaichi Odako Matsuri giant kite festival starts to be held annually. February 11: Yokaichi city and the towns of Eigenji-cho, Gokasho-cho, Aito-cho, and Koto-cho merged to form HigashiOmi city. Yokaichi and the four towns were thereby dissolved. Dec. 1 - Cable TV service commences by the HigashiOmi Cable TV. 2012 - The Yokaichi Odako Matsuri (Giant Kite Festival) changes its name to HigashiOmi Odako Matsuri. 2013 - The HigashiOmi Odako Matsuri (Giant Kite Festival) is held at the new site of Fureai Undo Koen Park in Notogawa for the first time. 2015 - The giant kite flown at the HigashiOmi Odako Matsuri (Giant Kite Festival) crashes on spectators, killing one person and injuring several others. 2016 - The HigashiOmi Odako Matsuri (Giant Kite Festival) is cancelled for the first time due to the fatal kite crash in May 2015. Higashi-Omi has agreed to pay ¥32 million in compensation to the family of the age 73 man from Sakai, Osaka who died when the giant kite fell on him at the Odako Matsuri giant kite festival in May 2015. Still unknown when the kite festival will restart. Won't be in 2018. The city is Shiga's third largest city in area. There was once an air field in the city. Takemura Masayoshi 武村 正義 (1934-) - Native of Yokaichi (Higashi-Omi) who served as mayor of Yokaichi in 1971, and elected governor of Shiga in 1974 serving three terms until 1986 during which he instituted a number of well-received environmental measures for Lake Biwa. That same year, he is elected to the National Diet. In 1993 in the cabinet of Hosokawa Morihiro, he becomes Chief Cabinet Secretary. During 1994-1996, in the Cabinet of Murayama Tomiichi, he serves as Minister of Finance when the consumption tax was raised from 3% to 5%. Other sights in neighboring cities/towns within easy reach from Higashi-Omi. Omi-Hachiman - Connected by Ohmi Railways Yokaichi Line in only 17 min. Minakuchi - In Koka, easily accesible via Ohmi Railways. Hino-cho - Easily accesible via Ohmi Railways. Hikone - Easily accessible via Ohmi Railways. This page was last edited on 18 April 2019, at 12:39.